Qualifies for 6 CE Hours in Ethics. Through text and cartoons, learn new insights into the psychological factors that influence your work and your client relations. Based on The Psychology of the Body by Elliot Greene and Barbara Goodrich-Dunn, this course explores the ethical issues related to the psychological defenses and body boundaries that profoundly influence people. Learn fresh approaches to recognizing and responding to ethical issues; using therapeutic frames, and confidently collaborating with mental health professionals. The textbook includes numerous cases studies and suggestions for applying the concepts through self-directed exercises. 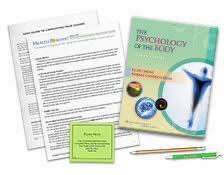 This textbook is the same one used for our Body Psychology course. It is also a valuable reference to use over and over. Very detailed text, but a little long winded, could tighten it up, less repetition; that being said, intellectually above average which is greatly appreciated compared to other online courses, overall, book is an impressive work. I have, after 15 years in the profession have been a better massage therapist this week applying principles emphasized in this course, I made a point to talk less to my clients and listen to their words and bodies more (and I already have been doing this...) I did it better and will do it even better going forward because of this course. Very fascinating course, will definitely recommend to to others! Very good course! Study materials were adequate and easily understood. The course itself was very interesting, especially for an ethics course. 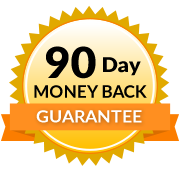 I feel like it advanced my knowledge of the psychological connections in massage, something that I feel as a professional is needed as he/she develops a clientele.I also liked that I could learn along with taking the test. I feel I had direction this way which made me retain the information. The website layout and ease of access was perfect. I will be taking classes here in the future! I found this to be one of the most challenging home study courses I have taken. Interesting content. Interesting perspective. It has been nice to learn a lot of totally new information. Thank you. The best on-line CEU I've ever taken. Very useful and easy to quickly bring into practice! Already seen more interest in my business due to changes made from information in this course. Thanks! This Ethics course far exceeded my expectations. The subject matter was truly fascinating, which, I'll admit is not always the case with Ethics courses. The sensitivity, intelligence and care with which the authors presented this material made for an incredibly thought provoking, illuminating and profoundly resonant course. I'm grateful for what I've gained from this text and am confident that the material will be valuable to me for the rest of my career. Thank you! I highly recommend this approach and deeper look at boundaries and ethics. 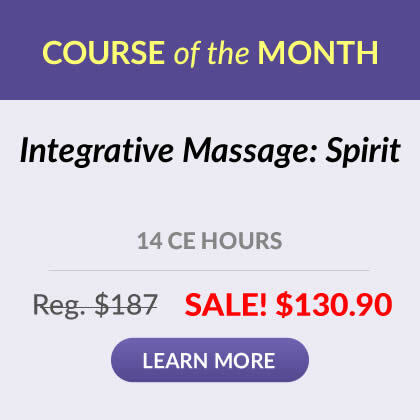 This course is very valuable in our profession as massage therapists, at any stage of our experience. This course really helped me to refresh on transference and counter-transference as well as other psychological aspects of massage. I worked in a Mental Health Profession for 15 years and we were required to uphold strict ethical standards so this information and behavior is not new to me. However, I have thought that the massage industry as a whole has been lacking in providing a thorough understanding of ethics and the importance of ethics in our industry. This ethics course should be standard teaching in all massage schools. It provides very clear explanations to why ethics is so important in massage therapy. It also provides many examples which are beneficial in understanding the sometimes difficult concepts. Thank you for providing such a great course! Some of the literature was clearly stated but was obscurely stated the test question portion. Nevertheless, this course was greatly informative and essential to therapists. This course was informative with many examples of different situations. Very detailed, somewhat challenging but a must for massage therapists in order to clarify good decision making and how to interpret different scenario's. I always find your staff very friendly and accommodating to my needs. I appreciate the discounts. This course was particularly helpful to me. I wish it has been available when I was in massage school in 1997. I have encountered other practitioners and massage schools who were unclear with the boundaries between massage therapy and psychological support and until now, it was confusing to me. I have a better understanding of the boundaries now and feel I can serve my clients in a more professional, respectful manner. Describe at least 1 way of identifying or responding to each of the 10 types of client defenses. Identify the essential elements in therapeutic relationships and roles; self-awareness and supervision. Describe the difference between massage therapy and psychotherapy in terms of scope of practice.